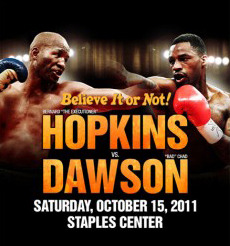 The California State Athletic Commission have overturned the original ruling from Bernard Hopkins’ October 15 title clash with Chad Dawson ruling it a no decision. After reviewing the fight, which ended abruptly when Hopkins suffered a shoulder injury as the result of being shoved to the canvas by Dawson in the second round, the Commission ruled that Dawson's action was an unintentional foul. Dawson was awarded a technical knockout victory on the night by referee Pat Russell after he deemed Hopkins unable to continue. The call was controversial and Hopkins and his promoter, Golden Boy Promotions, filed an immediate complaint with the California commission. Hopkins had already been restored as light-heavyweight champion by the WBC and Ring Magazine who’s titles were on the line and the ruling by the Californian Commission will rectify the blemish on his record. Speaking of the decision Hopkins said, ‘Justice was served today. I am thrilled that the California State Athletic Commission did the right thing and removed that loss from my record.